Palestinian President Mahmoud Abbas wants the Oslo Accords to be annulled. We should give him what he wants. Mr. Abbas declared his intention to annul the agreements after promising a “bombshell” in his speech to the UN General Assembly last month. Abbas claimed he would use “all peaceful and legal means” to end the peace process immediately. His first step? Incitement to genocide. Prior to the signing of Oslo I in 1993 the Palestine Liberation Organization (PLO) was a designated terror organization in the United States and Israel. Established to fight a guerilla war against the Jewish state, its governing document — the Palestine National Charter — called for Israel’s destruction. Member organizations of the PLO were responsible for bombings, hijackings, and the notorious 1972 Munich massacre of Israeli Olympic athletes. The PLO’s main political faction, Fatah, led by PLO founder Yasser Arafat, carried out numerous acts of terror killing thousands of innocent men, women and children. The PLO was declassified as a terror group in 1994, only after the international community recognized the Oslo process as the path to Arab-Israeli peace. Now that Mr. Abbas wants to end Oslo, he may get more that he bargained for. 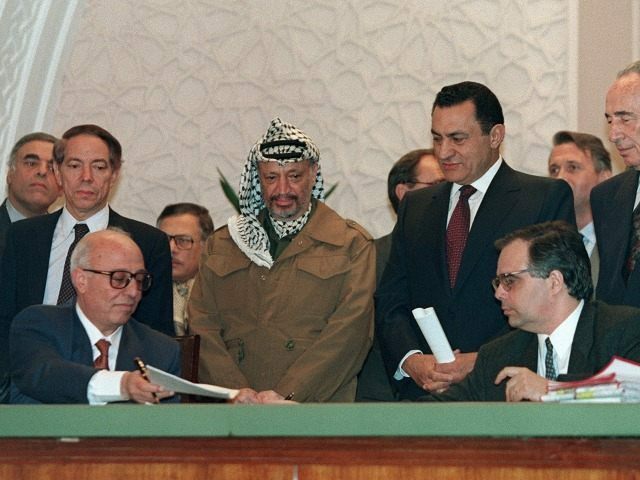 With the dissolution of the agreement, the PLO could return to its pre-1993 designation as a terrorist organization. As a result, funds would no longer flow from U.S. Treasury coffers and taxes would no longer be distributed to Palestinian officials through Israeli banks or customs unions. Under Executive Order 12947, individuals or entities attempting to transfer money to “foreign terrorists that disrupt the Middle East peace process”—such as the PLO—would be liable under federal laws criminalizing the provision of material support to terrorism. The Palestinian National Authority (PA) was established in 1994 as the direct result of the Oslo Accords to be the legitimate representative of Palestinians living in Gaza and the West Bank. The PA is an umbrella group of organizations including the Popular Front for the Liberation of Palestine and the Palestine Liberation Front, both of which are designated foreign terror organizations in the United States. The PA was designed to be distinct from the PLO, and under the Oslo framework, was envisioned as a five-year provisional body to be replaced by a sovereign Palestinian state once a final-status agreement was reached through negotiations. Instead, Mr. Abbas is in the eleventh year of his four-year term. He has been the recipient of billions in international aid—some of which, according to Ohio Congressman Steve Chabot, has disappeared into Abbas’ personal financial portfolio. The Oslo II Interim Agreement prohibits the PA from inciting violence. It requires both parties “to foster mutual understanding and tolerance and accordingly abstain from incitement, including hostile propaganda, against each other” and to “take legal measures to prevent such incitement by any organizations, groups or individuals within their jurisdiction.” Yet Mr. Abbas and other PA leaders have not only been inciting genocide, they have been condoning, funding and otherwise supporting a terror infrastructure that perpetrates war crimes against Israelis and Jews. Since day one, the destruction of the Jewish state—as opposed to the establishment of a Palestinian state—has been the PA’s raison d’être. In recent weeks the incitement has reached new heights as PLO and PA leaders have encouraged Palestinians to use cars, knives, guns and axes to murder Jews. Among the dead is a three-year-old girl, Chaya Zissel Braun, and a 76-year-old advocate for peace, Richard Lakin. Both American citizens, Chaya was murdered by a Palestinian man who rammed his car into a crowd of civilians, and Richard was the victim of a mass shooting on a bus in Jerusalem. Such depraved acts of cold blooded murder are what PLO Executive Committee member Mahmoud Ismail regards as the fulfillment of a Palestinian “national duty.” These repeated directives to murder Jews have occurred against a backdrop of anti-Semitic hate indoctrination perpetuated by Palestinian media and schools, where Palestinian children are instructed to commit suicide-homicide attacks with the goal of eradicating the Jewish state and its inhabitants. Despite their ongoing violations of international law, Mr. Abbas and other Palestinian officials have been protected by the ostensible legitimacy of the PA under Oslo’s terms. Consequently, the international community has been unwilling to take action against Mr. Abbas —whom they consider to be the only alternative to Hamas. As the lesser of two evils, Mr. Abbas the “statesman” has been literally getting away with murder. Without the protection of Oslo and the legitimacy it conferred on the PA, Mr. Abbas can be held liable in national and international legal tribunals for incitement to genocide, war crimes, and crimes against humanity. He has violated the Rome Statute of the International Criminal Court and the Convention on the Prevention and Punishment of the Crime of Genocide. He has also violated Israeli Law No. 5710-1950, which mirrors the Rome Statute and the Genocide Convention, as well as dozens of national laws in countries where universal jurisdiction makes these violations justiciable in domestic courts. Oslo sought to make politicians out of terrorists. But Mr. Abbas wants Oslo to go; so too would his power, prestige and the hoax of statesmanship. The international community should seriously consider his request. Amanda Berman is an attorney and the Director of Legal Affairs at the Lawfare Project. Brooke Goldstein is an attorney and the Director of the Lawfare Project. The Lawfare Project is a legal think tank that combats lawfare – the abuse of the law as a weapon of war against Western democracy.